Over the past nine months, the FBI has arrested five African Americans suspected of sympathizing with the Islamic State of Iraq and Syria (ISIS). John T. Booker Jr. was arrested for making preparations to bomb Fort Riley, a U.S. Army base in Kansas. Asia Siddiqui was charged with conspiracy to use weapons of mass destruction in the United States. Air Force veteran Tairod Nathan Webster Pugh was indicted for attempting to join ISIS and providing material support to the organization. And Hasan Edmonds, then an active member of the Illinois National Guard, along with his cousin, Jonas Edmonds, were arrested for attempting to carry out terrorist attacks in the United States on behalf of ISIS. These arrests necessitate an examination of why some African Americans might be drawn to violent extremist groups. The media have largely focused attention on warped interpretations of the Muslim faith held by a small population of people abroad and in the United States as a pathway to radicalization. An article in thegrio.com suggests the cause lies with the federal government framing African Americans. Yet, for African Americans, the call to violent radicalization may also be fueled by experiences with racism and the psychological effects stemming from them. If this is so, then racism in the United States is a national security threat. The report "Radicalization Processes Leading to Acts of Terrorism," submitted to the European Commission, makes clear that, as a codified expression of political thought, radicalism is different from "violent radicalization." Radicalism challenges the legitimacy of accepted norms but does not lead to violence in and of itself. Violent radicalization, on the other hand, is a form of terrorism that requires three conditions: 1) an enabling environment, 2) actors and motivations, and 3) a rallying ideology. American racism meets the conditions to spawn violent radicalization. Since the foundation of slavery, followed by the extant, oppressive residue of Jim Crow laws, African Americans have experienced this country as a hostile environment. Persistently underemployed, over incarcerated and tormented with racial aggressions and microaggressions, African Americans have long felt a sense of disenfranchisement from the promise of America that all men are created equal. However, the environment for African Americans has declined precipitously since the election of President Obama. What should have been the closing of the racial divide in America has instead opened more widely the fissures of racism. Indeed, since Obama's election the level of racial animus in the country has been greater than at any time since the Civil Rights Movement. The hostility toward African American men in particular is highlighted by the police-related deaths of Trayvon Martin, Michael Brown, Eric Garner, Tamir Rice, Walter Scott, Eric Harris and, most recently, Freddie Gray. Singly and collectively, these deaths have shaken African Americans to the core. Eric Garner and I are approximately the same age, height, skin tone, have the same attitude towards the police and live in the same city. The fact the there was video and the officer walked, I became depressed, angry and now numb like there's no hope. I'm always on edge, watching my own back. The surgeon's trauma emanates from a systemic environment of racism that Professor Michael Eric Dyson of Georgetown University calls "slow terror." Slow terror is masked yet malignant; It stalks black people in denied opportunities that others take for granted. Slow terror seeps into every nook and cranny of black existence: black boys and girls being expelled from school at higher rates than their white peers; Being harassed by unjust fines by local municipalities; Having billions of dollars of black wealth drained off because of shady financial instruments sold to blacks during the mortgage crisis; And being imprisoned out of proportion to our percentage in the population. So too, the myriad attacks on President Obama's personhood, citizenship and legitimacy, along with efforts to undermine his effectiveness, are a form of racial slow terror that may reinforce a view held by some African Americans of living in a hostile environment built on and sustained by American racism that must be eradicated. The nation, particularly republicans in Congress, should recognize that such attacks on President Obama say to African Americans that no matter how far they ascend, and irrespective of their educational and professional attainments, they are still the "N-word" and will be treated as such. That is part of the formula to create violent extremism in the United States. I navigate every weekday in a theatre of war through a maze of racial microaggressions hurled at me like insouciant, double entendre-tipped, weak seeking projectile missiles -- each of which MUST either be diffused or exploded on the spot. While most African Americans work through the effects of racism on their lives, for some, slow terror results in deep psychosocial affliction. A report titled "Physiological and Psychological Impact of Racism and Discrimination for African Americans," published by the American Psychological Association, notes that racism produces chronic stress for African Americans, who suffer from higher rates of both physiological and mental illness than white Americans or even other racial minorities. Psychology Today reports that racism is a mental health crisis contributing to increased rates of Post Traumatic Stress Disorder (PTSD) for African Americans. According to the National Survey of American Life (NSAL), African Americans show a prevalence rate of 9.1 percent for PTSD versus 6.8 percent in non-Hispanic whites. A smaller PTSD mental health disparity has been found in other racial minorities. The report maintains that African Americans with racial PTSD experience significantly more impairment at work and in carrying out everyday activities. Uniformed in jacket, bowtie, and an excellent education, I'm a black male burdened with a backpack containing a constant respectability requirement to live every public moment of my life as if I'm on a job interview -- deracinating a moving minefield of random racist stereotypes, step-by-step. So yes, a hostile environment created by anti-black racism most certainly induces internal stress approaching the level of PTSD. Although rare, people with untreated PTSD may act out violently, as has occurred when war veterans suffering from PTSD have committed acts of murder. Untreated, PTSD gives way to depression, anxiety and paranoia. When accompanied by substance abuse, racial PTSD can result in a toxic mixture of feeling oppressed, externalizing bias and psychosis. Under these circumstances, violent radicalization has fertile ground to take root. Dr. Joy DeGruy, in her book Post Traumatic Slave Syndrome, explores the effects of racial trauma on African American mental health. She posits slavery and racism have resulted in multigenerational maladaptive behaviors that continue as children whose parents suffer from PTSS indoctrinate them into the same behaviors long after the behaviors have lost their contextual relevance. Accordingly, PTSS is a disorder whose cure requires deep social and structural change to eliminate inequalities and injustice. The paucity of literature that exists on the subject suggests African Americans who subscribe to violent radicalization operate with an unsound moral compass, which is often influenced by psychosis. They are moral and ideological outliers. While we cannot be certain what prompted the five African Americans to join with ISIS, we can be sure that they, like most terrorists, were chock-full of what I term "externalized bias." 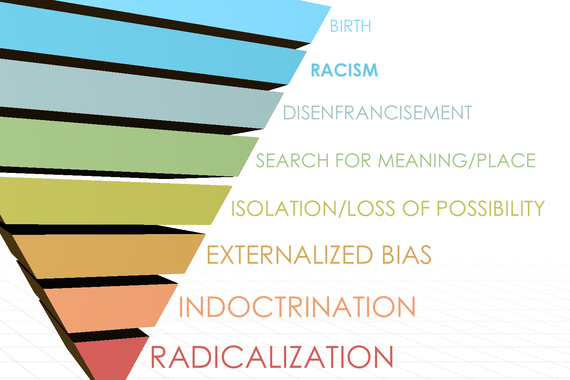 Externalized bias is the externalization of internalized hate onto the systems, tenets and actors of one's perceived oppression. It would be easy and, perhaps, satisfying to conclude that the five African Americans jailed as ISIS sympathizers are malcontents who hate the United States, and that's where the story ends. But the issue is where the story began. It may be that they are racially traumatized people who developed an inherent abhorrence for and willingness to conduct violent jihad against American racial hostility that has torn at their humanity and psychological stability. ISIS is simply a vehicle where their externalized hate meets structure and opportunity. ISIS recognizes the power of American racism to recruit new members to its cause. During the Ferguson protests, ISIS strategically placed recruiters in the crowd on Twitter and developed a recruitment video using footage from the protests. For African Americans, the rallying ideology to join with ISIS may be one of externalized bias in which the agent of oppression is not some distant land or misrepresented sense of Islam, but rather American racial hostility against its own citizens. Hence, the fight is not over there. It's here. ISIS may offer a compelling narrative to people who are disaffected from the social possibilities of their citizenship. With the creation of an Islamic caliphate, ISIS seeks to establish a territory governed by a moral code and religious laws, rather than what some consider the unjust criminal justice systems in America. ISIS pays foreign fighters $1,000 per month, about as much as one might make working at McDonald's full time. An African American, indeed, any American, who cannot get a job to support his family and who harbors a guttural hatred for America might well be compelled to take up arms in defense of his quest for true inclusion. A 2013 study in Psychiatry Research, "Externalized Attributional Bias in the Ultra High Risk (UHR) for Psychosis Populations," places African Americans in the UHR group and argues that externalizing attributional bias appears to be common in early psychosis. Too little attention has been given to studying this population, who are estimated to carry a risk for psychosis that is 400 times that of the general population. And too little attention has been paid to the fact that racism, as an external locus of control, is a contributing factor. 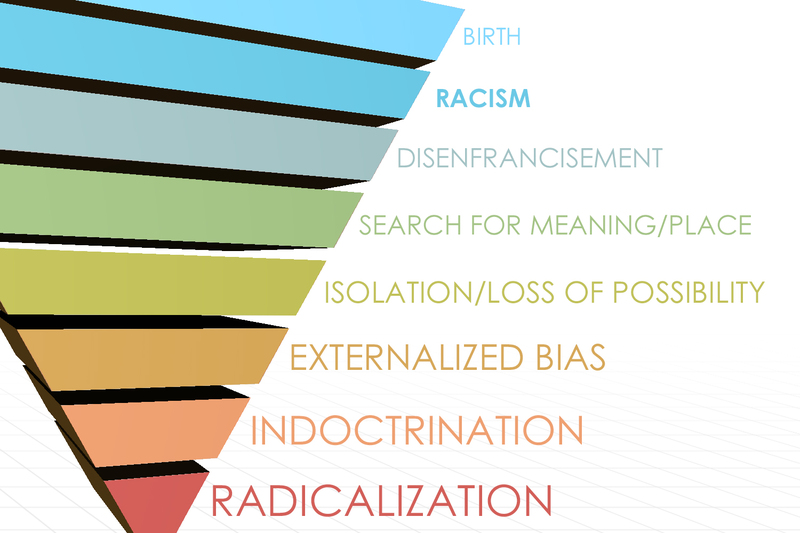 My own study of these factors outlines the route racism takes to violent radicalization in a graphic on the psychosocial path to African American radicalization. Racism is not only destroying black lives, it is causing some African Americans such psychological trauma that they have developed externalized bias as a coping mechanism -- feeding any sense of paranoia or psychosis they may have to deepen their attraction to violent radicalization. Attorney General Loretta E. Lynch said of the ISIS sympathizers that the United States would root out any threat to the homeland. But what if the threat to the United States comes from our own institutionalized racism? How do we root that out? 1. Institutionalized racism and externalized bias must be treated as national security threats that are giving rise to a new generation of extremists committed to harming the homeland. 2. Allocate part of the nation's counter terrorism budget to eradicating institutionalized racism, including: the prison industrial system, biased policing, economic violation of minorities and the poor, homelessness, and mental health disparities. 3. Create pathways to hope through respect for all people. Start by respecting President Obama and not killing unarmed black men. 4. Recognize that good people are complicit in nurturing racially stressful environments. Examine honestly any part you may play, and change it. 5. For business leaders, consider the potential threat that institutionalized racism poses to the security, productivity and profitability of your business. Like cyber attacks, institutionalized racism has a capacity to destroy businesses from the inside out. Dismantle institutionalized racism wherever you find it. 6. Ensure that all Americans have access to mental health care and that for minorities suffering from mental illness, racial PTSD is regularized as part of diagnostic assessment. Our nearly singular focus on Islam as the road to extremism blinds us to our national complicity in enabling a racialized environment, actors with motivations and a rallying ideology that gives rise to and nurtures violent radicalization. Frederick Douglass and W.E.B. DuBois famously argued that the central issue facing America in the 20th century was the "the problem of the color line." More than one hundred years later, the central problem facing the nation remains the color line. The color line, as a form of slow terror, is driving some African Americans to their breaking points. Rather than endure the unremitting blows of racism, they have opted for fast terror by joining with ISIS. They are no longer tolerant of American systems of injustice that have left them bereft of hope, faith or opportunity. They have decided to fight their oppressors, albeit their fight is really against oppression. Classic examples of "chickens coming home to roost," they prefer the terror of violent radicalization to the terror of being black in America. It is time for the nation to attack violent radicalization at its sources, one of which is American institutionalized racism.